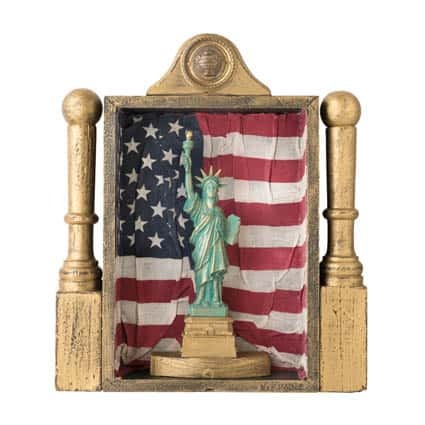 “Miss Liberty,” created by artist Warren Kimble, is part of the “Art of the Flag” exhibit on display at Brandon Artists Guild. Friday, June 5 at 5 p.m. — BRANDON — In anticipation of the coming 4th of July celebration in Brandon — celebrated like no one else with their huge parade and weekend of activities – take in this fun, yet sophisticated show of art, “Art of the Flag,” showing June 4 – 30 at Brandon Artists Guild. The opening reception is June 5, 5 – 7 p.m. This show is a celebration of American life and symbols as interpreted by four diverse artists, with the American flag as a common theme. The concept, created by Warren Kimble, is yet another way to enjoy his current style of assemblage complemented by the work of a few select artists, working inside and outside the box, exploring inventive new techniques. Participating artists are Warren Kimble, Karen Deets, Robin Kent and Mike Malone. Kimble is best known for his success as a licensed folk artist and a cheerleader for the arts in Vermont. Kent is known for her whimsical assemblages, Mayone for his photorealism painting, and Deets for detailed painted fired stained glass. Brandon Artists Guild is located at 7 Center Street, Brandon. For more info, call 802-247-4956 or visit www.brandonartistsguild.org.